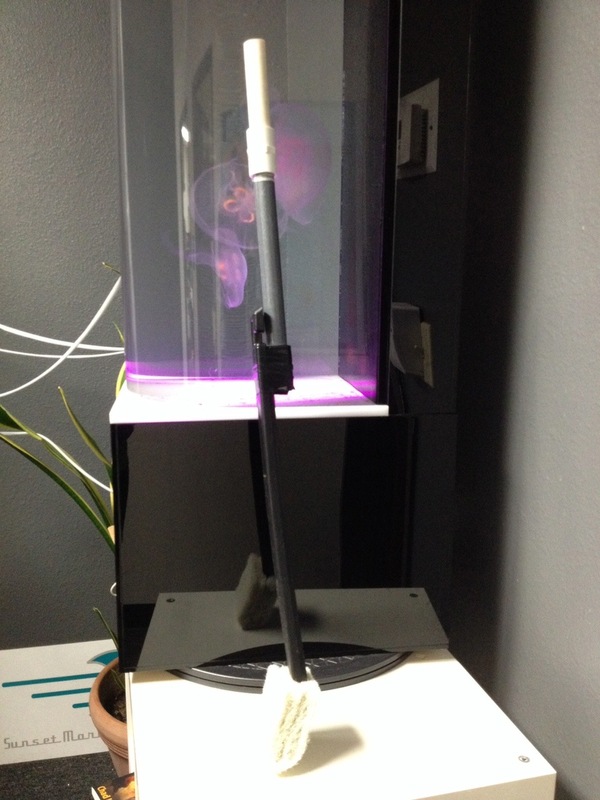 If you have the Eon 20 gallon Jellyfish System, you may have had difficulty cleaning the bottom of the tank. It’s easy to clean the sides of the tank with an aquarium cleaning magnet, but how to clean the bottom & back? There are some extension scrubber brushes out there (the black unit on the left in the picture), but in our experience these tend to be in adequate. They do extend nicely but….. The cleaning heads are minimal and after only 2 uses tends to fall apart. 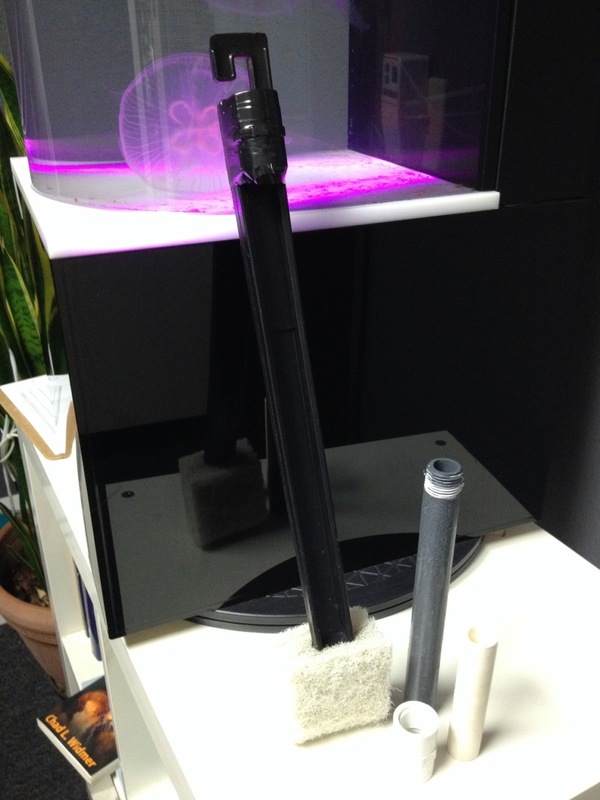 You can easily and cheaply build your own scrub brush using a standard acrylic aquarium scrub brush purchased at any fish store & a couple 1/2″ PVC fittings, 1/2″ PVC pipe & electrical tape found at Home Depot, Lowes or any home improvement store. First thing you want to do is secure the 1/2″ PVC Thread x Thread fitting to the scrub brush handle using electrical tape. Place the PVC fitting just below the hook on the scrub brush & using the electrical tape (about a 9″ long piece) secure the fitting to the scrub brush. Electrical tape stretches nicely, so stretch and then pull on the tape to join the two together & then continue wrapping the tape around the fitting and the scrub brush handle like the picture. Make it snug and tight! Now you can attach the extension handles. 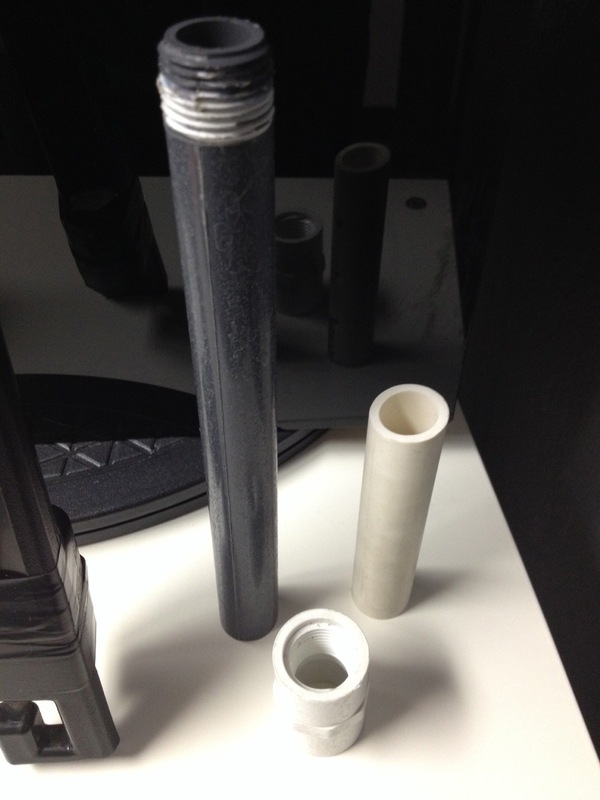 First, the threaded grey rod & then the white PVC pipe. Lickety Split! Easy! And cheap!